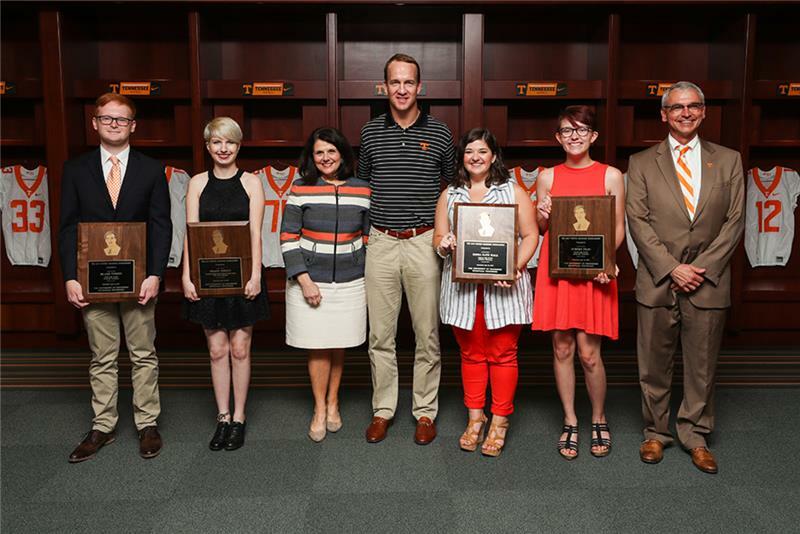 University of Tennessee, Knoxville, alumnus and retired NFL quarterback Peyton Manning was at his alma mater today to award scholarships to four incoming freshmen. This year's scholarship recipients are Emma Kate Hall of Lebanon, Tenn.; Grace Neiman of West Point, Ne. ; Sydney Peay of Spring Hill, Tenn.; and Blake Turpin of Knoxville. The Peyton Manning Scholarship Endowment was established in 1998 and, including this year's four recipients, 33 students have benefited from the scholarship. It is awarded to incoming students each year on the basis of academic achievement, leadership and community service. All Peyton Manning Scholars are part of the Haslam Scholars Program, the university's premier honors program. "My four years here at Tennessee were very special," Mr. Manning told the students and their families at the awards reception in the Peyton Manning Locker Room in Neyland Stadium. He said he hopes the scholarships provide the recipients "with some of the same opportunities I had when I was at school here. "Understand that this is just the beginning, and what a positive impact you will have on this great university and on the communities where you make your mark after graduation." Mr. Manning asked the students to make a note of the words on the sign above door leading from the locker room to the football field: "I will give my all for Tennessee today. "The responsibility of those words is not just for the football team, but for everyone associated with this great university. … Let the words displayed on the sign guide you moving forward and provide special meaning for your lives." Emma Kate Hall, a graduate of Lebanon High School in Lebanon, Tenn., plans to major in pre-medical studies. During high school, Ms. Hall was involved in student government, Future Health Professionals, the yearbook committee, Quiz Bowl, the Youth in Government Capitol conference and the National Honor Society. Ms. Hall "has a charisma and maturity about her that draws the attention and respect of not only her teachers but of her peers as well," one of her recommenders wrote. "Emma Kate not only exceeds expectations as a student but also as a leader among her fellow classmates." Grace Neiman, a graduate of Guardian Angles Central Catholic High School in West Point, Ne., plans to major in anthropology. She was involved in numerous high school activities: Quiz Bowl, concert band, speech competition, the Mid-State Conference Art Showcase and the National Honor Society. She also was the lead actress in her senior year musical. "As a student, Grace is as determined as they come," one of her nominators wrote. "Although most of the information comes very easily to her, Grace challenges herself by asking the most thought-provoking questions. She takes her work seriously, and always strives to do her best." Sydney Peay, a graduate of Summit High School in Spring Hill, Tenn., plans to major in sociology. Her high school activities included the National Honor Society; the Gay Straight Alliance; the Shine Student Leadership Team with GLSEN Tennessee, a statewide group devoted to LGBTQ issues; and the National Chemistry Olympiad. She won best in show at her school art show and was a Science Week volunteer for two years. "Sydney does not fit into any boxes; you cannot stereotype her in any way. She's completely unique, utterly surprising, and truly gifted," wrote one of her nominators. Blake Turpin, a graduate of Gibbs High School in Knoxville, plans to major in civil engineering. He was involved in the National Honor Society, the French Club, Student Government, Youth Leadership Knoxville and the Scholars' Bowl. He also made the District Top 10 in the Tennessee Mathematics Teachers Association Math Contest. A high school recommender wrote, "I can without hesitation say that Blake Turpin is one of the finest young people this educator has ever had the honor to teach." The scholarship presentation program also included remarks by Chancellor Beverly Davenport and Interim Provost John Zomchick, as well as the four recipients. While on campus, Mr. Manning also participated in a celebration of the naming of the Carmen and Deborah Tegano Dining Hall in Stokely Hall. A gift from Manning paved the way for the naming. Carmen Tegano is a longtime associate athletics director, and his wife, Deborah, was one of Mr. Manning's professors at UT. Mr. Manning earned his bachelor's degree in speech communication in three years, graduating at the end of his junior year. He returned for his senior season in 1997 and led the Vols to the SEC championship that year. Mr. Manning went on to play 18 seasons in the NFL — 14 with the Indianapolis Colts and the final four with the Denver Broncos. Considered one of the great quarterbacks of all time, he is a two-time Super Bowl champion who holds the NFL record for career touchdown passes and career passing yards. He was a five-time NFL Most Valuable Player and 14-time Pro Bowler.